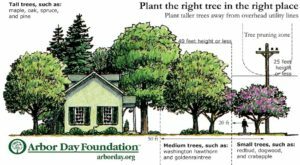 With fall advancing, we are into peak tree-planting season, and all across the country gardeners and home owners are choosing shade trees, ornamental trees, or planning to plant trees to screen their property or define a boundary. A lot of time will be spent choosing a location for that tree, considering where it will look best, or cast shade onto the ideal spot for lounge chairs or a children’s play area. All too often, though, we spend time looking around to decide that spot, but not looking up, to see what is overhead. A drive around any town will soon find examples of that lack of planning. Trees growing only on one side, or with ‘interesting’ gaps through the middle, are everywhere. In most places, the hydro authorities, who maintain the electricity and phone lines, are required to prevent trees from damaging them, and have absolute authority to do so – there is nothing you can do. Crews move around constantly, clearing branches away as they see fit, with very little if any regard to aesthetics, or that tree you planted to mark an important event. In some areas they may completely remove trees close to wires, but that is rare. Sometimes they cut the tree back well below the wires, and they then return every few years to give it a new ‘haircut’. If the tree is a naturally large one, it never achieves its proper glory. If the tree is not directly under the wires, only one side may be trimmed, creating the ‘half-trees’ that we often see. 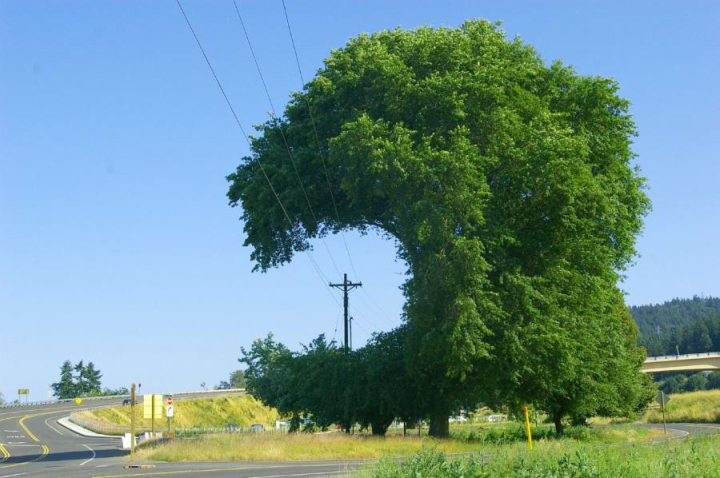 Sometimes they are trimmed into a ‘V-shape’, but whatever is done, the tree never develops a natural form, and often looks just plain absurd. The regular cutting also weakens the tree, and exposes it to infection, so these trees often die prematurely. It’s not just that trees close to the lines can tear them down in a storm, just by swaying around, or by branches breaking. Live high-voltage cables can fall to the ground, creating a life-threatening hazard. Remember that adventurous children like to climb trees, and they could come in contact with wires doing it. As well, if an arborist needs to work on this tree, it is now a very dangerous proposition, and they may refuse to do the work, or charge a premium. You can avoid this upsetting event with a little planning. Extend your look around for that perfect spot by looking up. It’s that simple – stand when you want to plant that tree and look up. What do you see? If there are wires directly overhead, or you are within 20 feet of the line of poles? If so, you are in what experts call the ‘Low Zone’, an area where only small trees can be planted. The exact size varies a little from one utility company to another, and it can be anything from 15 to 25 feet on either side of the poles. Don’t think that if you are not directly underneath the wires you are OK to plant anything you like. Even when you look up and see you are outside the ‘Low Zone’, you shouldn’t plant just any tree. Experts call the next 50 feet away the ‘Medium Zone’, and tall trees should not be planted there either. Only outside that 75-foot area can you plant larger trees, in the so-called ‘Tall Zone’. If you find that you want to plant a tree in that zone within 25 feet of the overhead wires, choose trees that have a mature height of less than 25 feet – within 25, stay under 25 – is the motto for this zone. When hunting for a suitable tree, check that the height being listed is the mature height, and not the height after 10 years, which is often given instead, especially for slow-growing trees. If you see different mature heights given, go with the biggest numbers, no wishful thinking! There are plenty of trees that mature less than 25 feet tall. 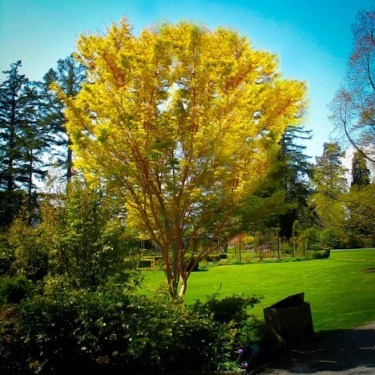 Consider taller Japanese maples, like the Coral Bark Maple (Acer palmatum ‘Sango-kaku’), which also often listed as only 12 feet tall, will normally reach that in 10 or 15 years, and will mature in time to a height over 20 feet tall. 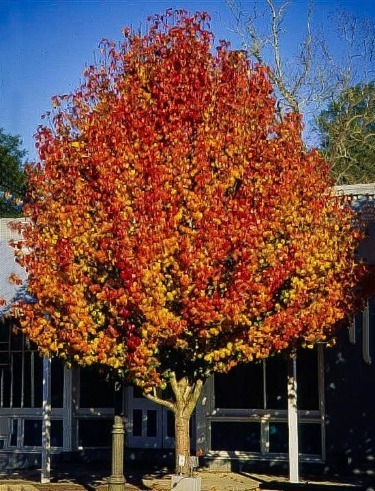 The Amur maple (Acer ginnala) is also small, with spectacular red fall coloring. If you are planting in a warm area, consider one of the larger Crape Myrtle trees, like the white-flowering variety called ‘Natchez’. This will grow quickly to about 25 feet in height – perfect for this planting zone. Redbuds are beautiful small flowering trees, with the Eastern Redbud (Cercis canadensis) for the east, and the Western Redbud (Cercis occidentalis) for drier, hotter states. Another tough but very attractive choice is the Japanese Tree Lilac (Syringa reticulata), or the Serviceberry (Amelanchier). All of the deciduous magnolias, which makes such a powerful show in spring, will be perfect here too. For evergreens, Austrian pine (Pinus nigra) stays small enough, but most will become too large. Within the next 40 or 50 feet, stick to trees less than 40 feet tall when mature. The motto here might be – 40 more? Stay under 40. The problem here is that taller trees in this zone could be blown down in a storm, and they could reach the wires and tear them down. As well, some very tall trees have a very wide crown, which could reach too close to the wires for safety. This zone is easier to plant in, since many popular trees mature under 40 feet. The Flowering Pear Tree (Pyrus calleyrana), which is smothered in white flowers every spring, is a perfect choice, and a tough tree too. It comes in several varieties, with ‘Aristocrat’, being a top pick. Any of the flowering cherries or plums, (Prunus), the flowering dogwoods (Cornus) and the mountain ash (Sorbus) are also beautiful trees for this zone. Among shade trees, most of the forms of the red maple (Acer rubrum) will stay below 40 feet, and they make a beautiful show in fall. Evergreens such as selected forms of blue spruce (Picea pungens) will normally fit here too, although check carefully, as some, such as Norway spruce, grow too tall for the Medium Zone. Here of course you can grow anything, even that towering redwood tree of your dreams. Sugar maple, Oak trees, the choice is yours. This is the place too, for larger evergreens, like spruce, fir, cypress and pine, which can grow in safety to majestic proportions. Just as you should look up before planting, it also pays to look down – in the ground that is, before you dig. All kinds of utilities, from water and gas to cable and electricity in some cities, are underground, and you should have a survey done to identify where these lines run, and adjust your planting spots accordingly. Too many people find themselves with broken water lines because they just simply started digging. . .
I’m writing from France. I’m currently working on pruning issues, especially regarding telecom infrastructures. The photo on the top of your web site has been used hundreds of time on the net. It seems that your has the best definition in pixels. Have you taken this picture yourself ? If yes, could you please tell me where ? If no, where does it come from ?